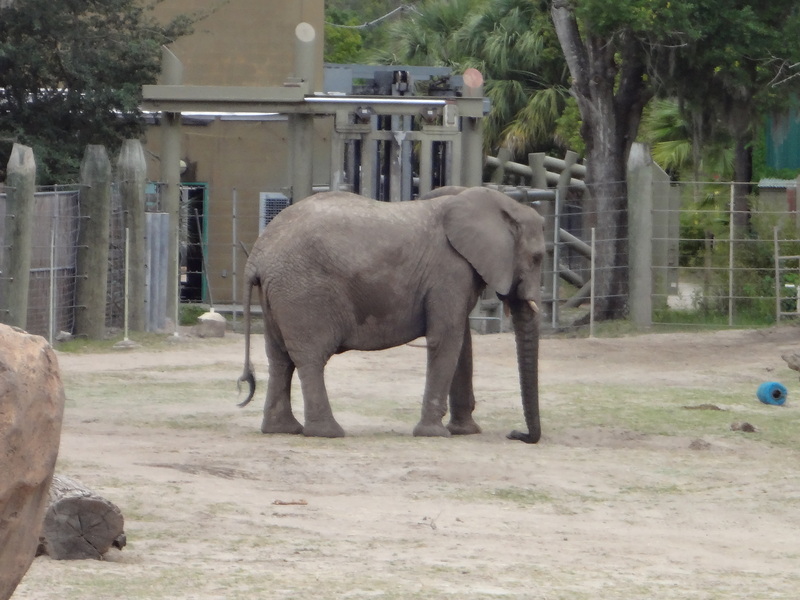 Watch our tour of the Lowry Park Zoo in Tampa Bay, Florida shot with the Sony WX50 Cybershot camera. If you’d like to create your own free video slideshow with your own photos click here. “We’re here!” I exclaimed as we pulled into the parking lot of the Lowry Park Zoo in Tampa Bay, Florida. Definitely not the easiest zoo to find for out-of-towners unfamiliar with the area but after a few wrong turns and u-turns to get back on the right track we had finally arrived. 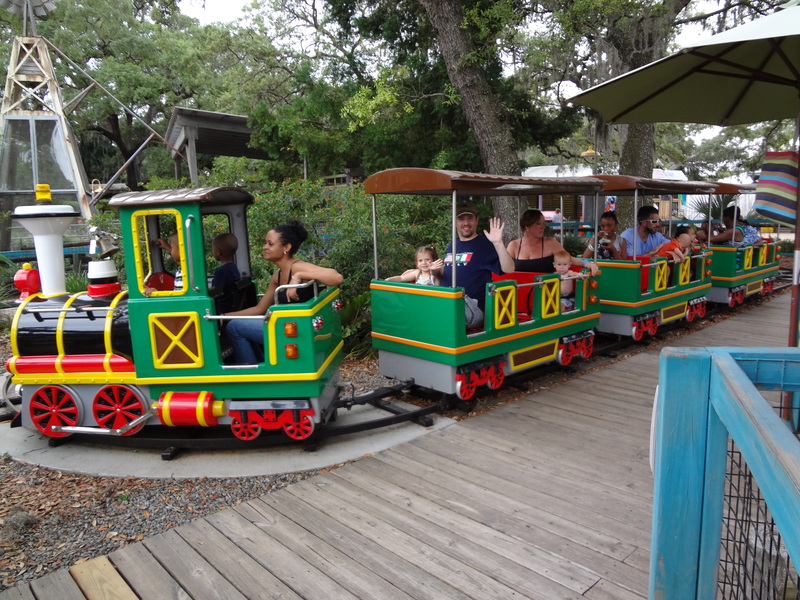 The Lowry Park Zoo has been voted “#1 Zoo in the U.S.” by Parents Magazine so our expectations were high as we paid the admission fee and entered the zoo. 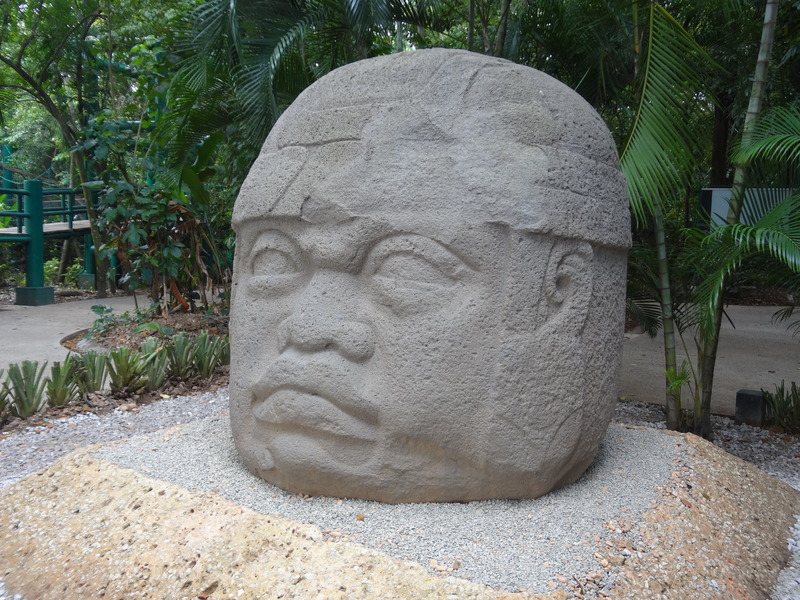 The first thing we saw upon entering was the Manatee Fountain from which emanated several different pathways that led visitors to multiple different exhibits. Now’s the perfect time to look over this map, I thought as I unfolded the free map I received when we entered the zoo. To our right was the Free Flight Aviary so we decided to start there. This exhibit was filled with birds such as the Boat-billed heron, African open-billed stork, Scarlet ibis, Bald ibis, White faced whistling duck, Ringed teal, Kenya crested guinea fowl, Purple swamp hen, Sun bittern, Pied imperial pigeon, White-breasted kingfisher, Blue-crowned motmot, Bearded barbet, Toco toucan, Magpie shrike among others. The birds weren’t really keeping my (almost) four-year-old daughter’s attention so we took a couple of photos and then exited. Upon exiting we were back at the Manatee Fountain. We next decided to go to the Primate World exhibit. 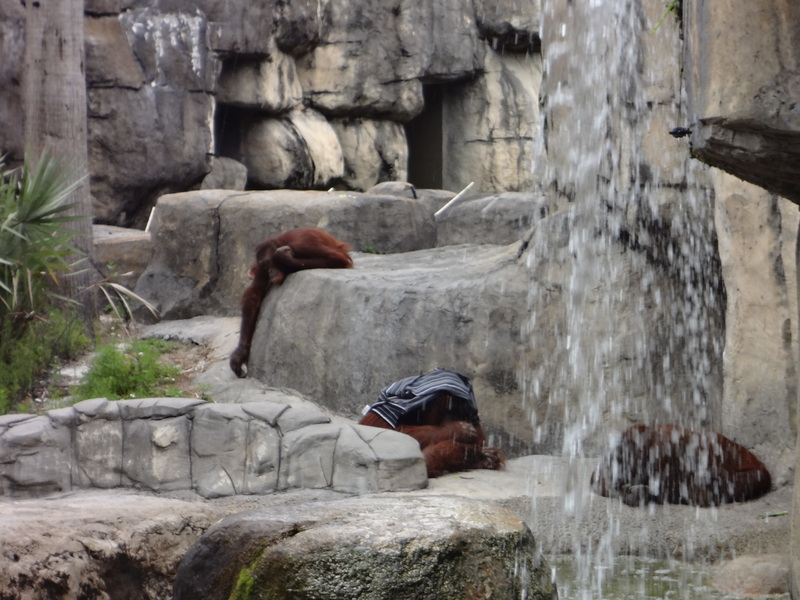 The first animals we saw were the Bornean Orangutans. While the adults were lounging near a waterfall, the youngsters were putting on quite the show on their massive jungle gym. We next visited the chimpanzees. Unfortunately they weren’t really doing anything so after a minute of watching stationary big balls of fur we moved on. The next monkeys were squirrel monkeys. These were a little more active than the previous chimpanzees. Next we saw mandrils, guenons, siamangs, and colobus monkeys. My little one was thrilled by all the monkeys and apes and their antics. After Primate World we next entered the Asian Gardens exhibit. 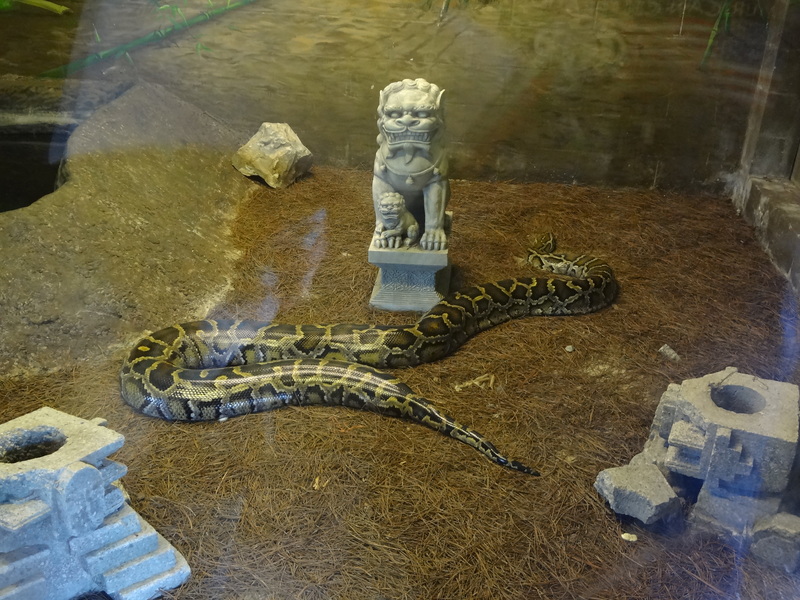 The first two animals we saw were the enormous Asian python and Komodo dragon as we headed toward Lorikeet Landing. We were hoping to feed the lorikeets but just as we arrived they closed down feedings to give the birds a rest. So we headed to the main area of the Asian Gardens. The overall Asian design of the gardens was quite nice and made for several great photo opportunities. After taking a photo of the main gate, we decided to go straight to the Malayan tiger exhibit (one of my daughter’s favorite animals!) Unfortunately, the tiger was lounging in the shade but my daughter was still thrilled she was able to see it. After the tiger was the Sloth Bear. Once again, this animal was asleep as well and just looked like a big ball of fur. It wasn’t until we saw his feet that we actually figured out we were looking at an animal at all. From here we entered the Sulawesi Aviary. The entryway was very nice, designed to look like the many old wooden structures I had seen throughout southeast Asia when I travelled there in 2002. Some of the bird species we saw inside included Bleeding heart dove, Javan pond heron, Sulawesi tarictic hornbill, Great argus pheasant, Mandarin duck, Crested wood partridge, Nicobar pigeon, Victoria crowned pigeon, Black-chinned fruit dove, Swan goose, Masked lapwing, Black-naped oriole, among others. This exhibit also housed the Reeve’s Muntjac, a miniature deer species from East and Southeast Asia, and two species of turtle: the giant asian pond turtle and the Indian star tortoise. 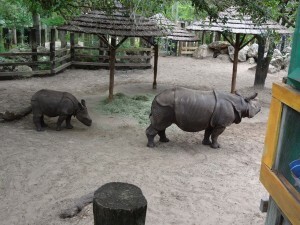 Upon exiting the Sulawesi Aviary next we saw the Indian Rhino enclosure. Inside was a mother rhino and her baby. They were quite active, walking around and interacting with each other. “Finally,” I thought to myself, “animals that aren’t asleep or look dead!” We stood and watched the mother and her baby for quite awhile as they roamed throughout the enclosure. From here we passed by the tufted deer enclosure and the Clouded Leopard enclosure. 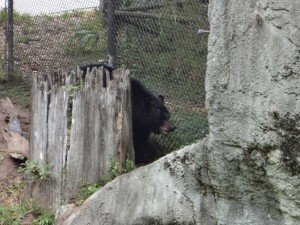 Half the fun was actually trying to find the animals which the enclosures were supposed to be housing. 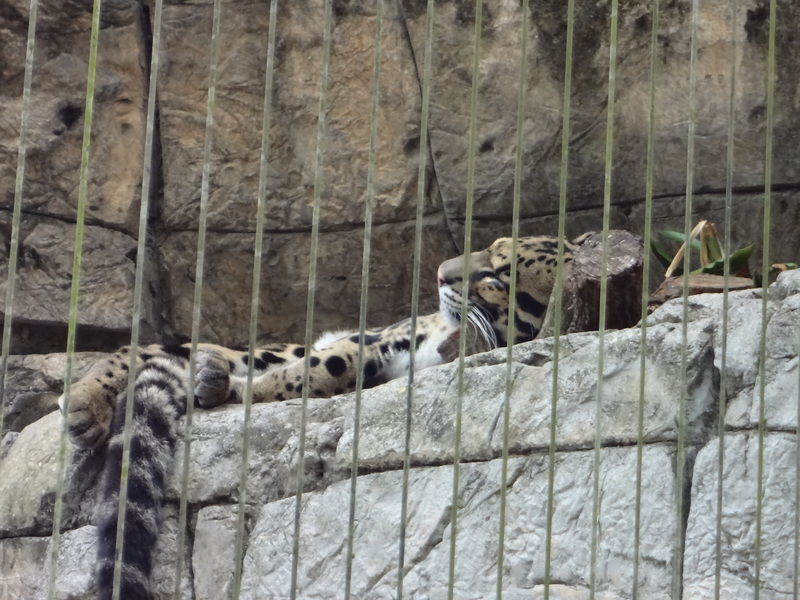 After a time we finally spotted the Clouded Leopard lounging up on a rock ledge barely visible to passers by. 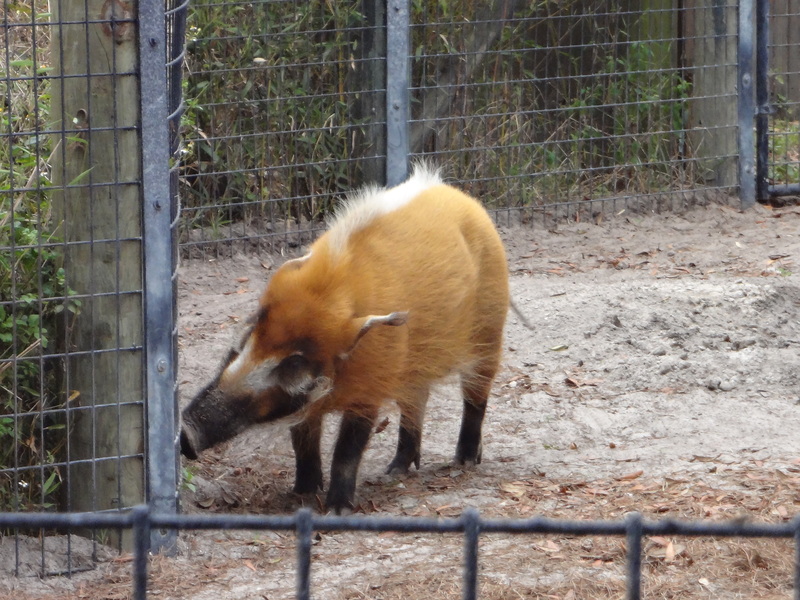 The final animals we saw in the Asian Gardens were the Babirusa and the Malayan tapir both hog-like animals from Southeast Asia. They reminded me of my trip to Malaysia in 2002. After exiting the Asian Gardens we took a long walking path past Lake Sharon and the Blanchard Garden. 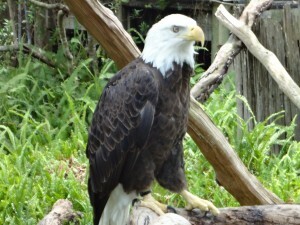 Nearby was the Zoo Ventures Theater Bird of Prey Show. 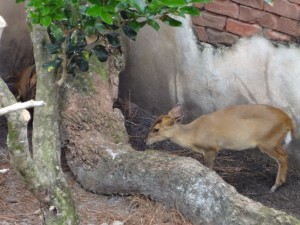 There were no showings anytime soon so we continued past an enclosure containing small Key Deer and Whooping Cranes. From here we continued onto the Key West Dock and into the Discovery Center. 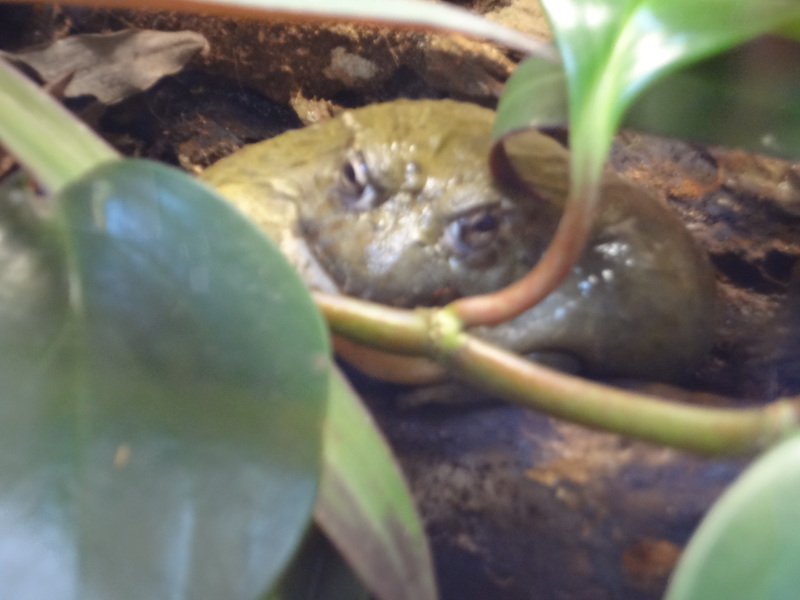 The Discovery Center was filled with aquariums featuring various animals from snakes to lizards to frogs and more. 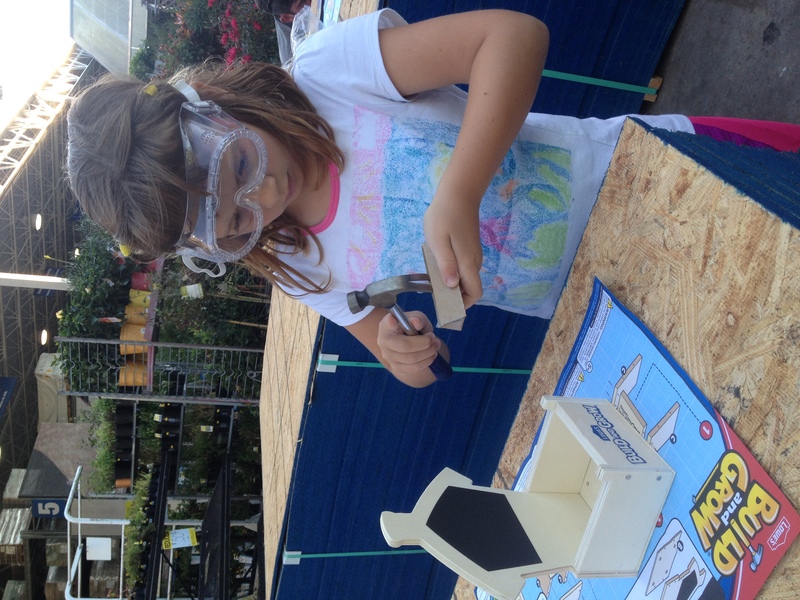 There were also various hands-on activities which my daughter thoroughly enjoyed. She especially enjoyed opening all the drawers to see new things would be revealed. Some drawers housed butterfly and bug collections while others contained bones or snake skins. After exiting the Discovery Center we passed an outdoor enclosure featuring a bald eagle. 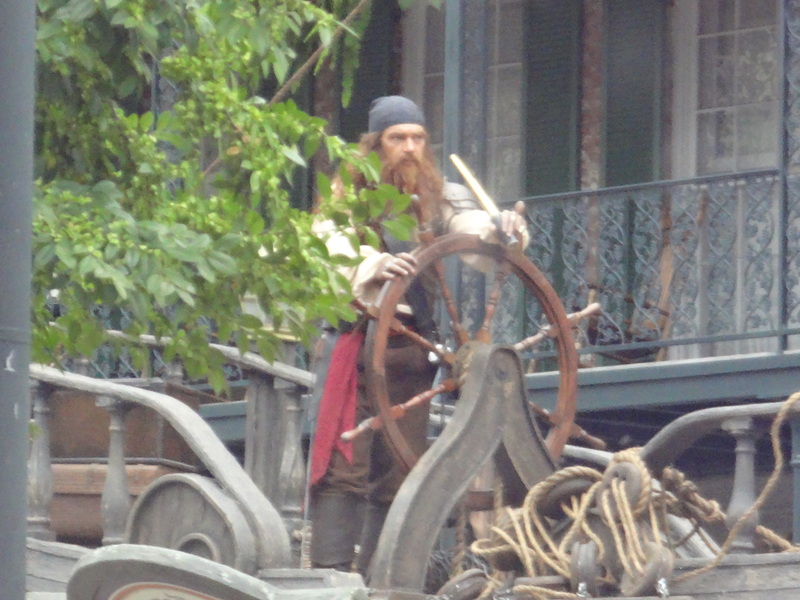 It was making a very distinctive call as we passed by so I pulled out my camera and took some video. Next we entered the Manatee and Aquatic Center. Ever since seeing her first manatees at the South Florida Museum in Bradenton, Florida my daughter has loved manatees. And the Manatee and Aquatic Center did not disappoint. The first creature we saw was an alligator snapping turtle. Although large in comparison to regular turtles most people are familiar with it was still significantly smaller than alligator snapping turtles I’ve seen on display elsewhere. The next tank held my favorite sea creature: sea horses. I could watch these little creatures for hours but we had to keep moving towards the main event: the manatees! 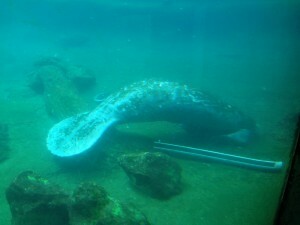 The manatee aquarium featured a large viewing window through which to watch the graceful, slow-moving manatees as they swam through their habitat. Other creatures also shared this habitat with them including turtles and fish. There were still a few heads of lettuce floating on the surface of the water from a recent feeding which the manatees were still occasionally nibbling on. 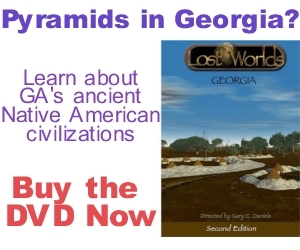 It’s easy to see how legends of mermaids came into existence while watching these creatures. It’s also easy to see why there are so many collisions between boats and manatees. These creatures are so slow-moving they simply don’t have a chance against a fast-moving boat. All of the manatees in the tank were rescued from such accidents and now spend their days in peaceful luxury safe from such dangers. 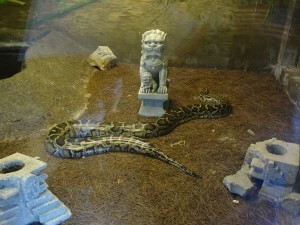 After leaving the manatees we exited the Aquatic Center and encountered the River Otter exhibit. Here were located several river otters in a nice-sized habitat that recreated their natural environment. The otters were putting on quite the show for onlookers, chasing each other both on land and in the water. 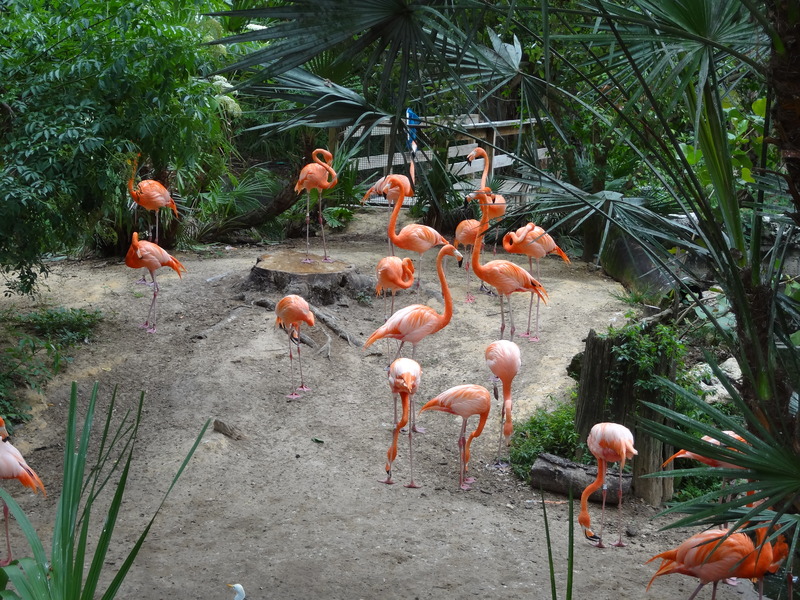 The next two enclosures featured Florida’s most colorful creatures: the Roseate spoonbill and the Caribbean Flamingo. Both of these pink-colored species of birds can be found in south Florida. 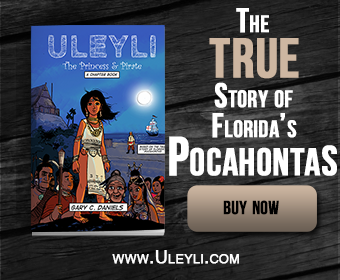 In fact, the spoonbill’s unique beak was an important item in Native American trade networks for the past 3500 years as were alligator teeth and hides. 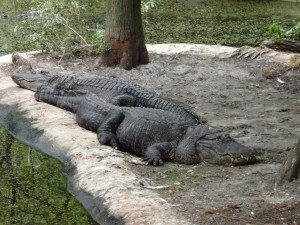 Thus a visit to the Lowry Park Zoo reveals not only the interesting animals that still live in Florida but also the long history those animals have in relationship to humans. 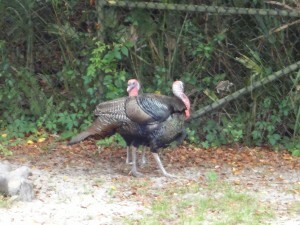 The skunk, Florida black bear and red wolf were the next three animals we encountered on the Florida Boardwalk. Once again these animals were either in hiding or sleeping during the midday heat. The only photos we managed to take were of these animals walking away from us. 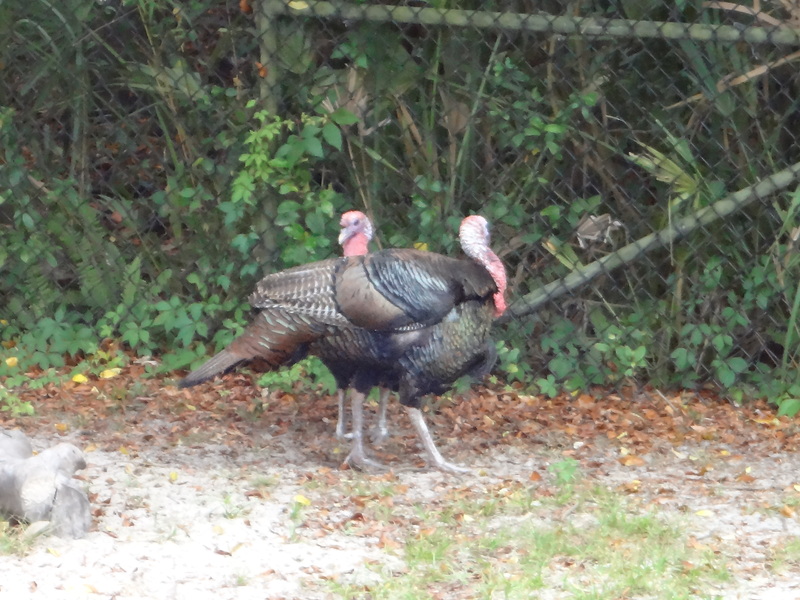 So we continued walking until we came to the Wild Turkey enclosure. This time we were not disappointed because there were several of these tasty birds walking around their habitat. From here we noticed a plume or log ride in front of us. Unlike most zoos, the Lowry Park Zoo actually has several theme park style rides that are free with your paid admission. The Gator Falls log ride requires riders to meet a minimum height which my daughter didn’t meet thus I had to ride alone. 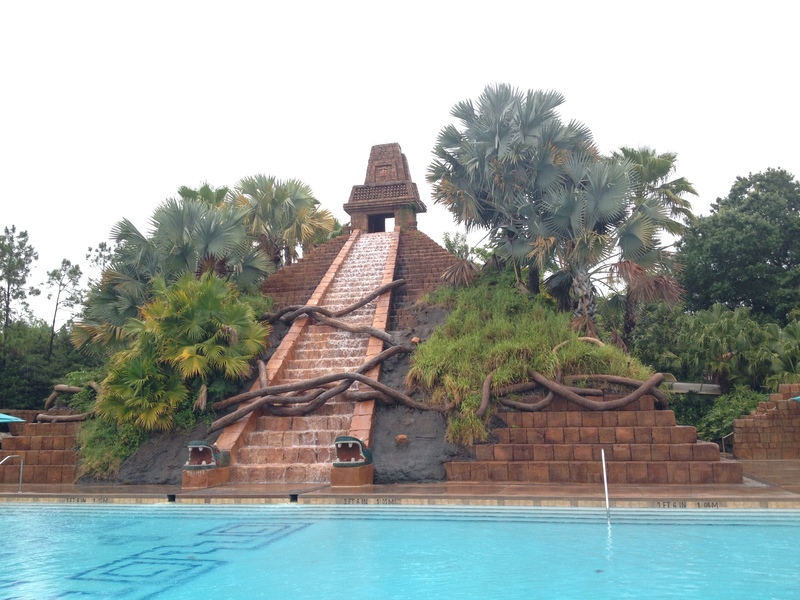 The ride takes riders high above the park into the tree canopy then over a pool of Philippine crocodiles before plunging down a steep fall ending with a giant splash. 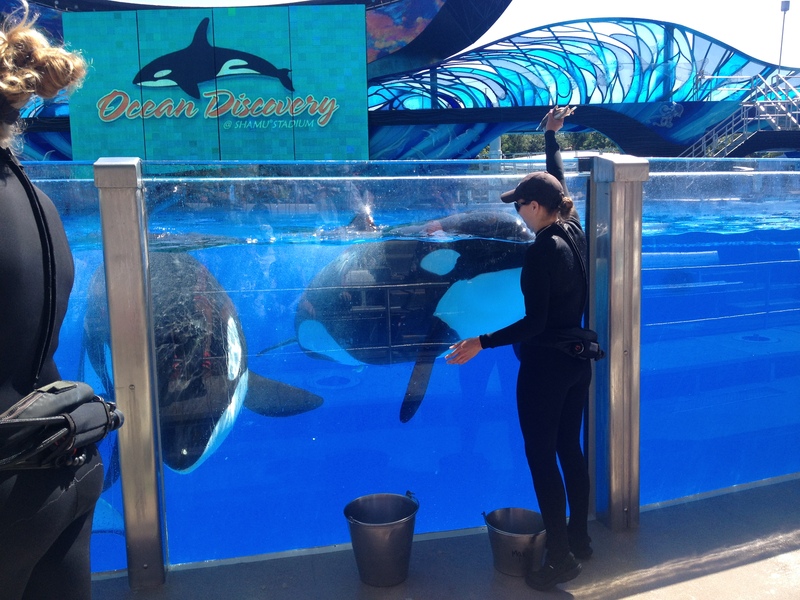 It was a great way to cool off after a day in the hot Florida sun. 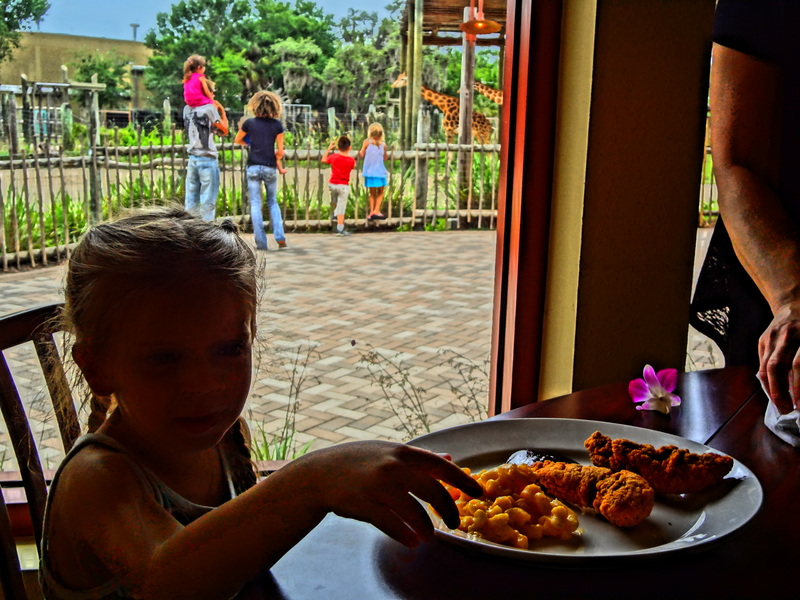 Dining while giraffes walk by in the background. 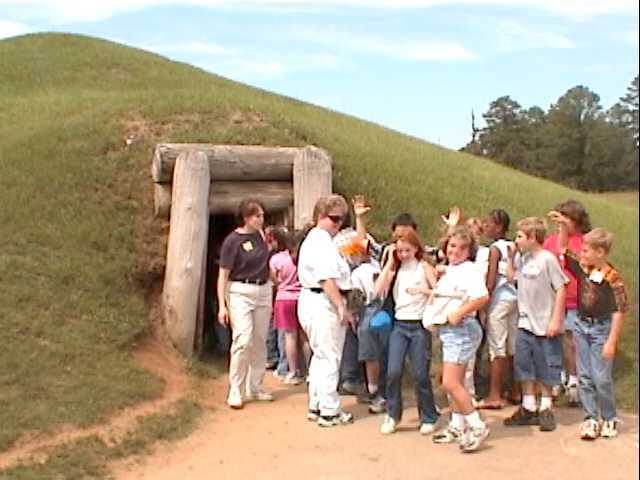 We had burned off our breakfast and everyone was starving so it was time to look for a place to eat. 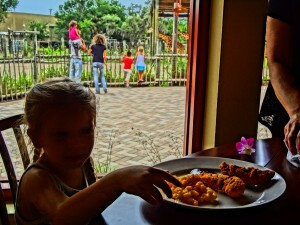 We checked our map and found an interesting restaurant in the Safari Africa area called Reilly’s Reserve which featured views of elephants and other animals. After a bathroom pit stop we headed straight there. The restaurant featured a decent buffet featuring prime rib and other entrees. We had arrived a little before closing so all the food looked a little dry but we were all starving and with a little gravy the meat was fine. Due to our late arrival most of the tables were empty so we were able to pick a window seat with a perfect view of the animals. The desserts were quite good as well but the views of the animals were the best part of this restaurant. After our late lunch we headed out into Safari Africa to see the sights. 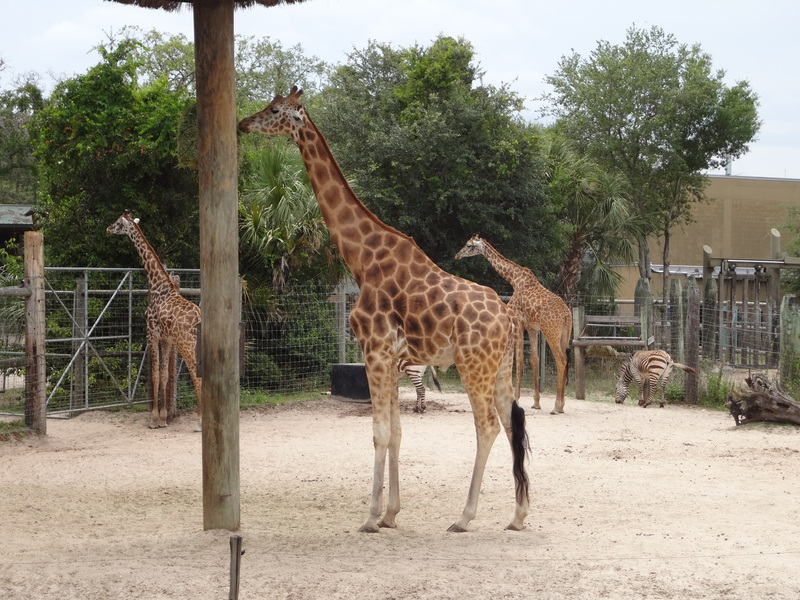 The first animals we encountered were the giraffes which we had been watching from our table. Among the giraffes were a few zebras as well. The theme song to Lion King began playing in my head. Our next stop was the Elephant Watering Hole. No elephants were actually in the water hole. Instead they were standing around in the distance but I still managed to get a photo of one. A few impala were wandering around the habitat as well. Across from the Elephant Watering Hole was the Camel Safari. 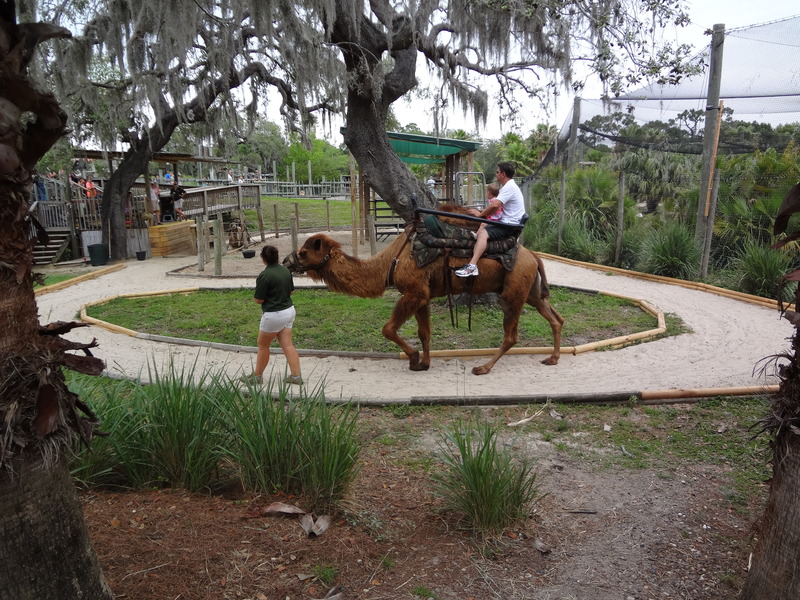 Here visitors could buy a ticket and wait in line to ride a camel. Past these exhibits was an enclosure housing African white rhinos and the Grevy’s zebra. The African rhino looked a lot different than the Indian rhino we had seen previously in the Asian Gardens exhibit. 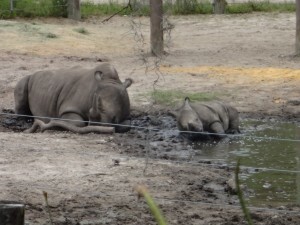 We saw one female rhino cooling off in the mud with her baby. There was also a painting of a safari captain with a face hole cut out where visitors could insert their own face for cute pictures. 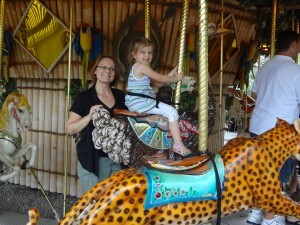 My wife and daughter eagerly took their turns as safari captain. After leaving the rhinos we entered an exhibit named Ituri Forest. The first enclosure we passed housed several different varieties of African storks. 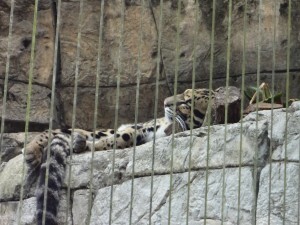 On the opposite side of the path was an enclosure housing cheetahs. 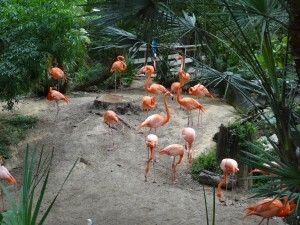 Beyond the cheetahs was another aviary housing many different types of birds native to Africa. Further on was an enclosure housing a pygmy hippo. The final two enclosures in this exhibit featured a Red River hog, okapi, and black dulker. Having finished our African Safari we headed back to the Safari Lodge area, took a few photos of the meerkats, and then exited the exhibit. 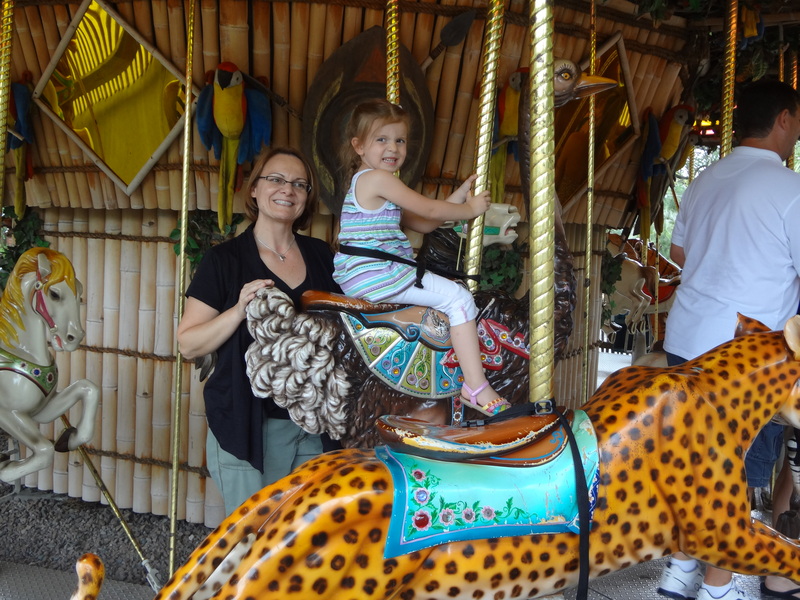 Upon exiting we encountered a large carousel called the Jungle Carousel. Instead of the typical horses and ponies the animals on this carousel were all jungle varieties from cheetahs to elephants. 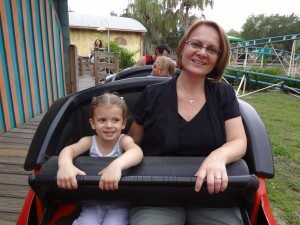 My daughter was thrilled she could actually ride this particular ride since she couldn’t ride the log ride. So her and mom picked an animal, climbed on top and enjoyed the ride. While waiting on my family I consulted the zoo map and saw one final exhibit we had yet to see: the Wallaroo Station Children’s Zoo. As soon as the carousel ride was over we headed directly there. The Wallaroo Station features a petting zoo, roller coaster, train ride, pony rides as well as various Australian animals such as Koala bears, emu, singing dog and wallabies. 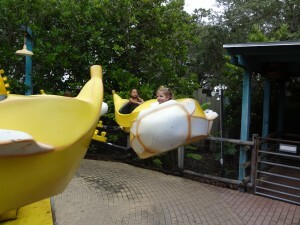 The first ride my daughter wanted to try was called Boomer’s Flyin’ Bananas ride. This cute little ride featured several banana-shaped cars that rose up and down as they circled round and round. My daughter was having the time of her life and convinced the operator to let her go around one more time before she finally had to get off. After exiting the flying bananas we headed to the Overland Express Train. Because of her age my daughter couldn’t ride alone so I climbed aboard and squeezed into the non adult-sized seats and enjoyed the ride. Although my daughter wasn’t happy when the ride came to an end, I was thrilled at the prospect of peeling myself out of the compressed sitting area I had somehow squeezed into. Our next stop in Wallaroo Station was the petting zoo. The barnyard was filled with various goats and lots of children trying to pet and brush these goats. 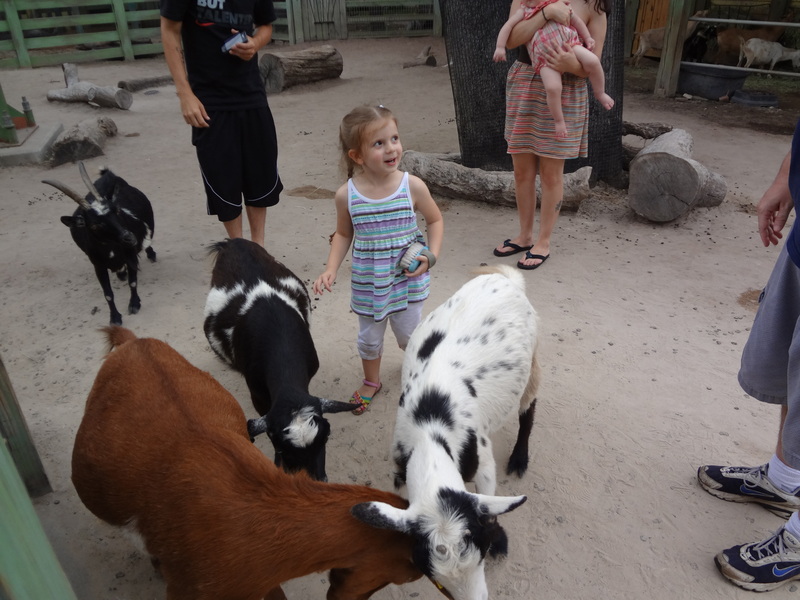 My daughter always thoroughly enjoys petting zoos and this was no exception. The only reason we left the petting zoo was because the zoo itself was getting ready to close and we wanted to ride the roller coaster before this happened. Which we did. And it was fun! Overall we had a full, fun day at the Lowry Park Zoo in Tampa Bay, Florida.